Over the weekend I've been reading "The Man From Mars" (2012, Tarcher/Penguin), and I think it's a must-read for anyone interested in the history of UFOlogy in America. "Mars" is a raucously entertaining book about a man who could fairly be described as the world's first UFO huckster, pulp publisher Ray A. Palmer (known to his many fans and detractors as simply "Rap"). The book, by Fred Nadis, recounts Rap's early involvement in science fiction publishing in the 1930s, first as a fanzine pioneer and then editor of the popular and influential Amazing Stories magazine. Not content to merely publish entertaining science fiction, Rap was a myth-maker, endlessly messing with his readers' minds by blurring the lines between reality and fantasy, fiction and non-fiction. "With its first issue in 1948, Fate also became a centerpiece for the newly forming flying saucer subculture. Unafraid of the tyranny of what he termed the 'raised eyebrow,' Palmer became the ideal figurehead for the new community of 'saucer people.'" 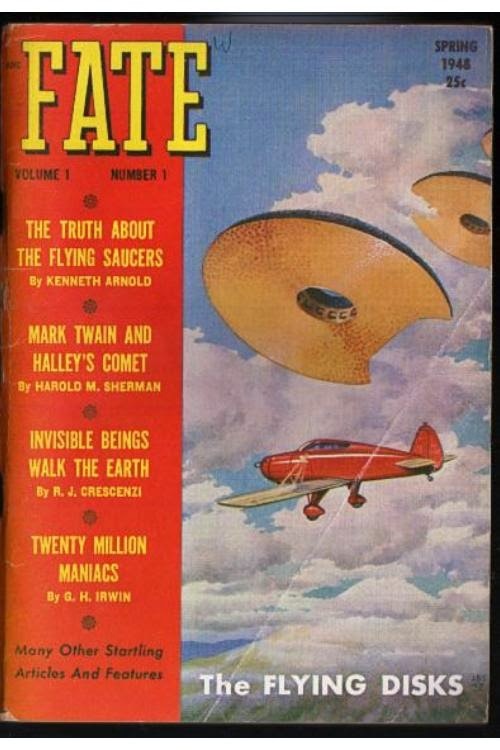 Not only did Rap convince Kenneth Arnold, who was quickly becoming a national laughingstock, to share his story in the first issue of Fate (see picture on right), he transformed Arnold from the world's first flying saucer witness into the world's first flying saucer investigator. 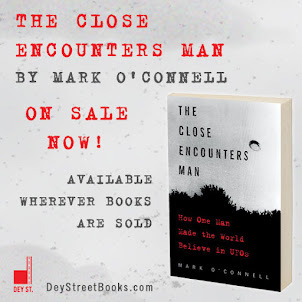 In a wild story worthy of the pulp fiction he had been publishing for years, Rap sent Arnold out to investigate the Maury Island, Washington, sighting, and the assignment soon turned hairy... Before Arnold gave up and headed home in frustration, the bizarre case had come to involve the FBI, the Men In Black, a disappearing house, flying saucer fragments... and, possibly, sabotage and murder. "In the fall of 1948, the first flying saucer convention was held at the Labor Temple on 14th Street in New York City. Attended by about thirty people, most of whom were clutching the latest issue of Fate, the meeting quickly dissolved into a shouting match. Although the flying saucer mystery was only a year old, the side issues of government conspiracy and censorship already dominated the situation because of their strong emotional appeal"
Think about that. In the fall of 1948, just a little over a year since Arnold had sighted his flying saucers, "government conspiracy and censorship" were already emerging as the predominant themes among the "saucer people." Read the book. 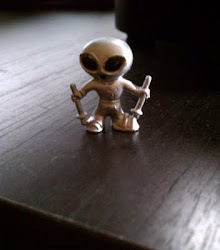 For good or bad, it's because of Ray Palmer and his exuberant myth-making that we're now stuck with Disclosure, the Roswell Incident, Area 51 and Dulce Base. Thanks Rap. That Keel quote about the NYC convention, "...the side issues of government conspiracy and censorship already dominated the situation..."
My quick search doesn't find any independent reference to this. I see that Keel used that passage in another article, and places where others cite it. The birth of the UFO cover-up conspiracy is almost more interesting to me than flying saucers. With your contacts, maybe you can find more. If so, I'd like to see them in a future post. Keel's comments almost make it sound as though the coverup and conspiracy theories just burst onto the scene fully-developed, only months after the Arnold sighting, don't they? There has got to be more to the story than that, but this book doesn't tell it, unfortunately. Keel has a lot of devout followers, but as far as I have been able to determine, his work is only slightly more reliable than Palmer's. A little polish goes a long way in this field. The book about Arnold's adventures in the Maury Island farce is of course full of Palmer nonsense. There are some interesting connections there, though, and the very thorough deconstruction available at Saturday Night Uforia is well worth reading. Not for people with short attention spans.